4Cs Breeding Technologies partnered with the Virginia Institute of Marine Science (VIMS) and the Rutgers Haskin Shellfish Research Lab (HSRL) to produce and distribute tetraploid brood stock throughout the East Coast shellfish industry for the eastern oyster, C. virginica. The following research was performed by these two organizations. Both studies showed the decided value of triploidy for aquaculture. The Virginia test showed a meat yield that was consistently twice as large for triploids over diploids as well as a more rapid growth rate. Triploid oysters reached 3” (75mm) six to twelve months sooner than diploids, and the mortality rate for triploid oysters in high disease areas was also three times lower. This experiment was set up to determine whether triploids were better overall than diploids by replicating the experiment using different spawns. Four separate spawns of diploids and triploids (4n x 2n) were produced using disease resistant tetraploids and diploids (eight spawns in all). All eight groups were deployed in three regions of the Chesapeake Bay: Kinsale (low salinity), York River (medium salinity) and Lynnhaven (med-high salinity). For two years, yield and survival were measured. After more than two years in the field, growth rate and survival were evaluated in the two ploidies, among all three spawns. Results below are reported by site. In this study, perhaps the most surprising observation is the improved survival of triploids over diploids. Given that both triploids and diploids are produced from disease-resistant stocks, such a difference would not be expected if gene action were the only factor accounting for performance. This study determined that the triploid cross imparts a higher survival rate, but as of yet the cause of this has not been determined. Possible explanations range from heterosis (hybrid vigor) to healthier triploids in the summer, when diploids are spawning. This experience is different in other areas, however, such as the U.S. West Coast with C. gigas, where repeated use has shown that triploid oysters grow well in some locations but not others. The study determined that each farmer will have to make a decision regarding the suitability of triploids for their particular site. Growth rate (mm), 2n & 3n: At all sites, triploids (▲) grew more rapidly than diploids (●) especially during summer. The result is that in all locations, average length of triploids reached market size faster than diploids. This difference varied from about six months sooner (Kinsale) to a year or more sooner (York). The time to market size obviously has implications of the enterprise budget of oyster aquaculture. The average meat weight of diploids (█) and triploids (█) was determined after more than two years in the field. 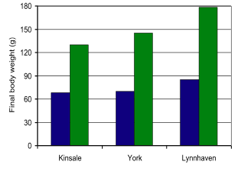 Triploids were meatier than diploids by the following amounts at each site: Kinsale – 204%, York – 207%, and Lynnhaven – 209%. By this time, triploids were larger than standard 3” market size. Greater yield is a particularly important trait for spa-on-shell production. A study conducted by Haskin Shellfish Laboratory of Rutgers University was designed to test the performance of triploids in New Jersey and Massachusetts. In this test, triploid and control groups were produced. Triploids were made by mating 4n males from the Rutgers disease resistant NEH with both NEH females (producing 3NN) and a Flowers line (FMF from Long Island, producing 3FN). Diploids were NEH x NEH (2NN) or NEH x FMF (2FN). The four groups were deployed in triplicate at Cape Shore in NJ and Katama Bay in MA. At 15 months, triploids were significantly larger than diploids by all measures. At Cape Shore, the 3FN yielded about 169% more meat weight than the best diploid (2FN). Positive value for triploids was also found in HSRL trials in New Jersey and Massachusetts. Even at three months old, researchers saw a visible difference between the diploids and triploids. Compared to southern sites, triploids have generally seemed less advantageous in the North, possibly as a result of the delay of spawning of younger oysters. In the HSRL study, however, the value of triploids proved exciting after only 15 months. In Massacusetts, both triploid groups outperformed either diploid group. 3NN produced 117% higher meat yield than the best diploid group.